This luxury Legends townhome located in the Bridger Creek neighborhood in Bozeman is a well-appointed 2 bedroom, 2 bathroom home. The home is surrounded by trails for hiking, biking or taking a stroll with friends and family. Within blocks of the home you will find the Bridger Creek Golf Course, and just a short drive through the canyon will land you at Bridger Bowl, where you can "ski the cold smoke." The home is very cozy with an open floor plan and high ceilings. 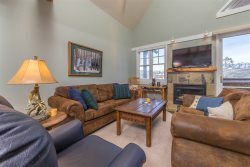 Everyone in your party can be together while cooking dinner or enjoying a movie by the stone fireplace. The kitchen is equipped with stainless steel appliances, a gas range, granite counter tops and all appliances and cookware a chef needs! There are large windows throughout allowing for natural lighting in any room you enter. Get your crew together to enjoy cards, board games, a front porch BBQ or a movie from DirecTV satellite, a ROKU smart TV with Netflix and tons of other viewing options. Additional parking needed? No problem! The home is equipped with a garage, driveway parking and, should you need more, street parking. This property was everything we ever could have dreamed of! The location was an amazing location close to both downtown Bozeman and Bridger Bowl. The house itself is extremely clean, has great amenities and appliances and made us feel like we were right at home! Thank you for the incredible stay!